Stop wasting valuable time tracking down employees while that important client waits on the phone. OfficeStatus puts staff location, status, and availability information at the fingertips of your entire organization! 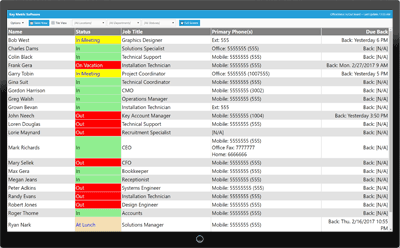 OfficeStatus is an easy-to-use in/out board software system for tracking employee work status, time & attendance, and more. It includes web, mobile and desktop user interfaces - making it accessible from anywhere. Enjoy transparent (everything-included) pricing, easy deployment, great customization options, and market-leading features - all with no monthly maintenance fees. Learn about the new features in OfficeStatus 6! Employee location, presence, status & availability - at a glance! FREE 30-day evaluation. Try OfficeStatus for yourself today! OfficeStatus Server supports Windows Server 2016, 2012, 2008, and 2003. Windows Client runs on Windows 10, 8, 7, Vista, and XP.